Today was supposed to mark a step forward in human flights for the Apollo program. Instead, flames exploded inside the capsule during a pre-flight test. The fatal accident changed the nature of America’s space program. 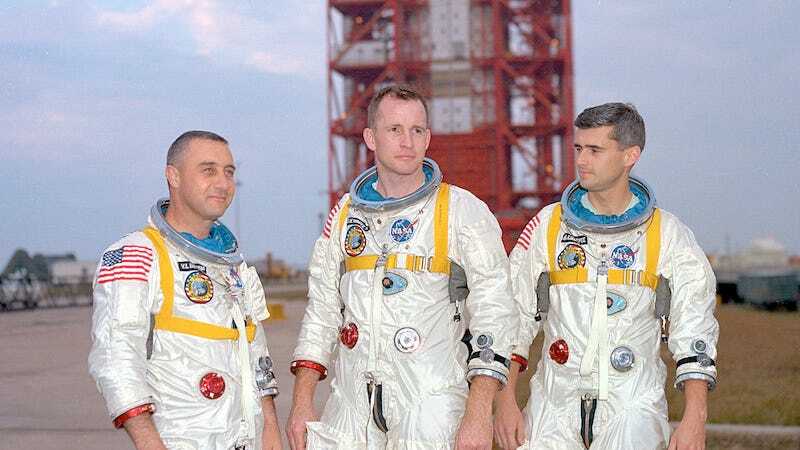 The fatal flames on January 27, 1967 killed Gus Grissom, Ed White, and Roger Chaffee. The three were in the capsule for a plug-outs test, wearing space suits sealed within the pressurized module as it ran on its own module. During the second run through the checklist, the fire started. The 100% oxygen atmosphere fed the electrical fire, the increasing pressure rupturing the capsule wall. Shrapnel injured ground crew, while smoke billowed out to smother them. Within 26 seconds, the horrified ground team heard garbled voices yelling, and saw flame sweeping across the camera. It took five full minutes for the ground crew to peel open all three hatches, trading off as heat and smoke forced them to retreat. Grissom was one of the original Mercury Seven astronauts. During his inaugural flight, both his capsule and spacesuit flooded with seawater after splashdown. He also flew during Gemini, becoming the first veteran astronaut to fly again. Grissom removed his restraints during the fire and worked with White to try to open the capsule. His body was found on the capsule’s floor. White was in the second class of astronauts, first flying during project Gemini. He as the first American to spacewalk, and loved it so much he had to be ordered to reenter the capsule. “I’m coming back in... and it’s the saddest moment of my life,” he said as he reentered. He was also one of the first astronauts to litter, losing a thermal space glove that drifted out of the hatch. This would have been his second flight. The fire burned through White’s restraints, and he was found laying just below the hatch which he had been struggling to open. Chaffee was a rookie astronaut, selected for the third class of astronauts. He worked ground support during the Gemini program, and flew chase planes with Grissom during Saturn 1B tests. He was a last-minute replacement for rookie Donn Eisele, who dislocated his shoulder leading up to the test flight. This was to be his first spaceflight. Chaffee stayed at his post during the fire, following orders to try to maintain communications until his seniors opened the hatch. The electrical fire and deaths of Grissom, White, and Chaffee triggered NASA to start prioritizing safety, revamping the culture of their exploration program. Prior to the accident, several astronauts had expressed concerns about the Apollo module. Its hatch was designed for structural integrity, not emergencies—the three layers would require 90 seconds of coordinated effort by astronauts and ground crew to open even under ideal circumstances. This, along with other changes to test planning, manufacturing processes, and quality control, were all redesigned in the aftermath of Apollo 1. As part of the new emphasis on safety, NASA officials approached cartoonist Charles Schulz for permission to make Snoopy a mascot for safety. He agreed, leading to an ongoing tradition of astronauts gifting their ground crews with a silver Snoopy pin they’ve carried to space. Receiving the pin is a high honor, acknowledging the crew’s contributions to ensuring safety of the human spaceflight program.